Manchester United ended their pre-season tour with a 3-1 win over arch-rivals Liverpool in the final of the International Champions Cup friendly tournament on Monday. Second-half goals from Juan Mata, Wayne Rooney and Jesse Lingard were sufficient to overturn an early Steven Gerrard penalty. The victory completed an unbeaten run of five pre-season matches for the club under new manager Louis van Gaal. Brendan Rodgers’ side provided the biggest test for the ‘Red Devils’, who only gathered momentum while the match at the Sun Life Stadium, home of the NFL’s Miami Dolphins, wore on. 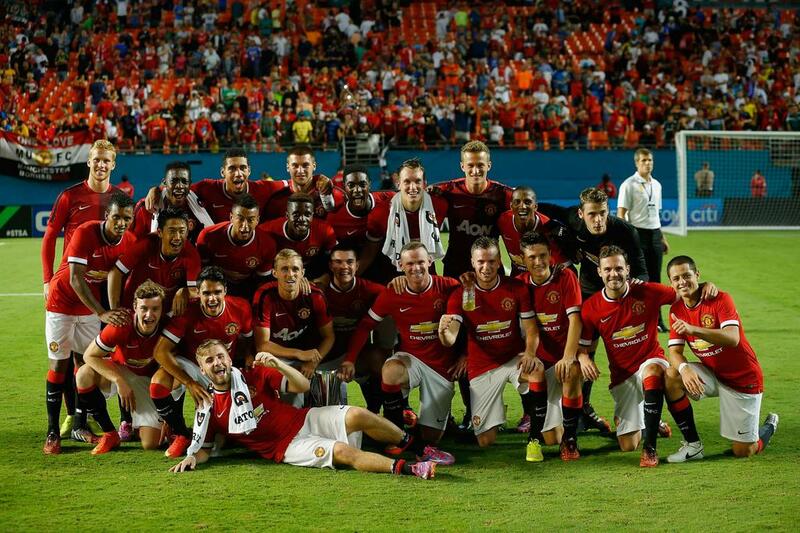 Manchester United Win ICC Cup in Miami. Image: Man Utd via Getty Image. Rooney captained the Manchester team for the first time on the 2014 tour of the United States in front of 51,014 fans. Ex-England international Gerrard gave the ‘Reds’ the lead from the penalty spot on 14th minute, after winger Raheem Sterling was fouled by Phil Jones in the vital area, the third penalty United have conceded in their pre-season. Rooney restored parity in the 55th minute, when Javier Hernandez floated in a cross from the right wing; good enough it evaded Simon Mignolet. Mata then beat Mignolet with a low shot to place United in ascendancy two minutes later following a well-weighted pass from summer recruit Luke Shaw. Lingard completed scoring for Van Gaal’s team in the 88th minute, firing an Ashley Young pass past the Liverpool goalkeeper. Ghana Humbles Egypt 6-1 in World Cup Playoff.